A new book which may be of interest to some. Runciman and Paddy worked together at the British Council in Athens after the second world war. By the time he died, in 2000 at the age of 97, Sir Steven Runciman knew that he was a “‘relict of a past age’”, the “embodiment of a…nearly mythical era.” Minoo Dinshaw’s brilliantly entertaining biography of the great historian of Byzantium restores him to public view and provides a vivid picture of many aspects of 20th-century Europe that now seem almost as remote as the crusades and religious schisms he described in his books. Runciman was not aristocratic by birth—his grandfather, a shipping magnate, had established the family fortune—but he was immensely grand and well connected. His parents were the first married couple to sit together in the House of Commons. And his father, who was part of Lord Asquith’s cabinet before the first world war, survived the declining fortunes of the Liberal party to lead the doomed mission to Czechoslovakia in 1938. He could claim in 1991 to have known every 20th-century prime minister except Sir Henry Campbell-Bannerman, who died when he was a toddler, and Bonar Law, “‘whom nobody knew’”. Introduced by his governess to French, Latin and Greek by the age of seven, he won scholarships to Eton—in an era of clever men like George Orwell, Cyril Connolly and Anthony Powell—and to Cambridge, where he lived in the “scornfully beautiful Great Court” of Trinity College. Through his friend Dadie Rylands (they were named the Tea Party Cats “for their velvety urbanity”) he met Lytton Strachey, John Maynard Keynes and other members of the Bloomsbury group. Despite frequent trips to London to socialise with the “bright young people” (and be photographed with his budgerigar by Cecil Beaton), Runciman won the first-class degree and prize fellowship that were to launch his academic career. Of the Cambridge spies recruited in the 1930s, Guy Burgess was a pupil and friend and Anthony Blunt a “supercilious” colleague. Employing political and diplomatic connections to the full, he travelled in style to Romania, Bulgaria and Asia. He established his reputation with histories of the emperor Romanus Lecapenus, the first Bulgarian empire and Byzantium. When he inherited wealth from his grandfather in 1938, he gave up his university fellowship. Unfit for military service, Runciman spent the war in the Balkans and the Middle East: in Sofia as press attaché to the British Legation, Jerusalem, Cairo and Istanbul. There he narrowly escaped a bomb blast, spent three years as professor of Byzantine history and art, and became an honorary Dervish. Between 1945 and 1947 he led the British Council in Athens. Osbert Lancaster, a witty cartoonist, and Patrick Leigh Fermor, who would become a glamorous writer, were there. Greece was lurching towards civil war and Runciman gained an abiding love for the country, pleasure from upstaging the British ambassador and the position of Astrologer Royal. On his return to Britain, Runciman split his time between London and the Hebrides, and wrote the books that were to make his name: the ground-breaking three-volume “History of the Crusades”; and a succession of works on Byzantine history that drew on a wide variety of sources, Muslim and Greek, most notably “The Sicilian Vespers” and “The Fall of Constantinople”. Francis Birrell, a Bloomsbury acquaintance, had greeted Runciman’s first book with the acknowledgment that fewer than “half a dozen people were really competent” to review it (and that he was not one of them). There were no such reservations about later volumes, which were lively, authoritative and well received. Runciman was not to everyone’s taste. He loved to tease, possessed a “queenly persona”, snubbed people who failed to interest him and “had a tongue like a viper if he wanted to use it”. He was a gossip who adored royalty; he entertained the Queen Mother to lunch at the Athenaeum Club every year; four queens are said to have attended his 80th-birthday party. Despite being able to compose an alphabet of lovers with every letter except Q (“I shall die Qless”), he was to claim that he had “never been in love”. He retained a wide circle of loyal friends and was a popular laird of the Isle of Eigg, not least because he would invite his musical friends to stay and perform at the village hall. (Yehudi Menuhin was “memorably described” by the ferryman as “a handy man for a ceilidh”). He gave his name and time to numerous public bodies and causes, at home and abroad. A final apotheosis, three months before he died, for his service as Grand Orator to the Patriarch of Constantinople, was a descent by helicopter on the Holy Mountain of Athos. Mr Dinshaw’s choice of subject for his first book is an inspired one. He interweaves the strands of a long and variegated life with sympathy, elegance and awareness of the wider picture. In recognition of Runciman’s fascination with the supernatural, chapters are headed with quotations from Arthur Waite’s “The Key to the Tarot”. He refers frequently to novelists such as Evelyn Waugh and Olivia Manning, authors of trilogies about the war. And his turn of phrase is as arresting as Runciman’s own—one family friend is “unceremonious, crapulous”. Mr Dinshaw has done Runciman proud. To whom will he turn his attention next? 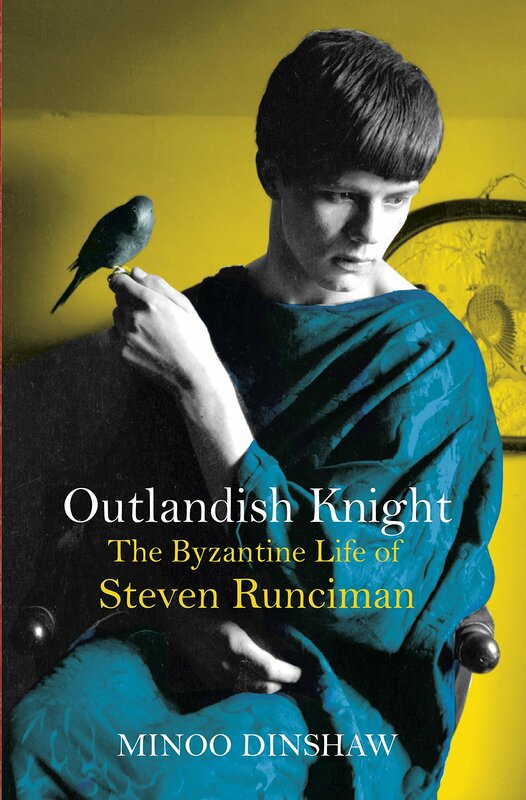 Buy Outlandish Knight: The Byzantine Life of Steven Runciman . Click the link. This entry was posted in Paddy's Friends and tagged Athens, Steven Runciman on September 10, 2016 by proverbs6to10.